MiniStation Thunderbolt offers easy plug and play USB and Thunderbolt storage featuring the revolutionary Thunderbolt technology for unparalleled transfer speeds and a USB port for universal connectivity. With speeds up to 10 Gbps, the MiniStation Thunderbolt portable hard drive offers speeds 2X FASTER than USB 3.0, giving you the fastest portable storage interface ever. 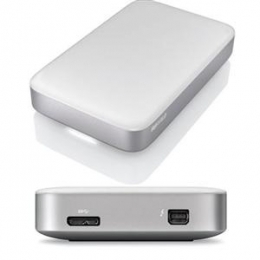 Perfect as a PC* or Mac portable hard drive, the MiniStation Thunderbolt portable hard drive offers the latest and fastest connection interfaces available.